Departure Points: Florence. Other departure points available. Note: While custom private tours of Assisi itself are available daily, the inside guided tours of the Basilica and the church of St. Claire are not possible on Sundays. You may still visit them on your own. 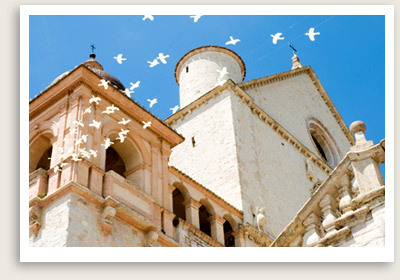 Perugia & Assisi Tours Include: Our private guided tours of Assisi and Perugia include transportation, services of your English-speaking driving guide, taxes, tolls and parking. 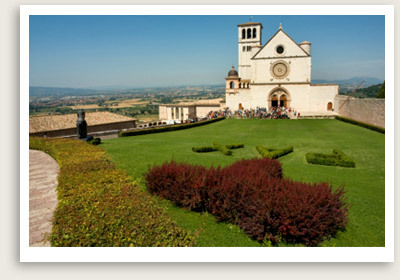 Optional: Licensed local tour guide in Assisi for the art and churches. An excellent tour guide leads this Assisi guided tour. This private tour of Assisi and Perugia begins with a lovely drive south of Florence through the Arno Valley into one of the Italy’s most picturesque regions: Umbria. Umbria is called the “green heart” of the country for its colorful landscapes dominated by olive trees and vineyards. You will pass along the fourth largest lake of Italy called Lago Trasimeno, where Hannibal defeated the Romans in 247 B.C. Only 20 minutes east of Perugia, Assisi sweeps the flanks of Mt. Subasio in a broad curve, like a pink ship sailing over the green sea of the valley below. Sister cities of San Francisco and Bethlem, Assisi attracts thousands of pilgrims every year, particularly for its connection to the beloved Saints Francis and Claire. You will also stop and have short guided tour Perugia, a beautiful Etruscan town known for its artisanal chocolate.